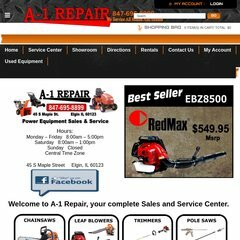 Topics: Showroom, Directions, Rentals, Chainsaws, Pole Saws, and Blowers. The programming language environment is ASP.NET. There are 3 Nameservers, dns1.3dcart.com, dns3.3dcart.com, and dns2.3dcart.com. It is hosted by 3dcart Shopping Cart Software (Florida, Oakland,) using Microsoft-IIS/6 web server. PING (50.23.238.142) 56(84) bytes of data. Pinging the server, resulted in a 34.6 ms response.